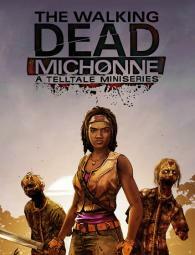 'What We Deserve' is the third and final act of the 'The Walking Dead: Michonne' miniseries by Telltale. It follows 'In Too Deep' and 'Give No Shelter'. Telltale has a habit of making surprising endings for their penultimate chapters, and last episode definitely gave us a surprise. Michonne and company have escaped from the boat town of Monroe and fled into the woods with unlikely allies. Now they have holed up in a defensible compound as a last stand against the tyrannical Norma, who is coming for her brother. Things are made complicated by the presence of a family of strangers, including several children. Norma has emerged as a thoroughly unscrupulous villain, and yet I can’t help but be fascinated by her. I feel like her control over Monroe is mostly benevolent, not of the dictatorial type but more of a maternal one. She wants to grow a real community, not with coercion but with cooperation. And yet, when faced with adversity, she becomes angry, mean, and vindictive. This is especially true where her brother is concerned - she is fiercely protective of him. Michonne has become a serious thorn in her side, but Norma has made the mistake of underestimating her. Norma is one of the few characters who have grown or changed in any way since this short series began. Michonne changes all the time, of course, depending on my actions, but there is precious little time for the others. One exception is Sam, who started out as a shady thief but, in the presence of her wayward family, has become something of a parent herself. Michonne can appreciate this, as she continues to struggle with the demons of her own past. This manifests itself as increasingly common hallucinations that often slow down or cripple Michonne. She doubts herself constantly, and the guilt of losing her two girls threatens to consume her. So far in the series this has been merely a distraction, but now it has reached fever pitch and Michonne is going to have to either come to grips with what happened or let it consume her in a supernova of shame and regret. The details have been piecemeal, with just suggestions and innuendo explaining how boring, pre-apocalypse lawyer Michonne became aggressive warrior Michonne. 'What We Deserve' has an answer for this, and while it is subtle and understated, it avoids being contrived or trite. In short, it’s quite touching, which I suppose is no surprise considering what Telltale has been capable of in the past. When the series started, the wandering nature of Michonne combined with the opening setting, a fishing boat that is nomadic by design, gave me the impression that this would be kind of an exploratory story. They would sail around the coast, meeting people, perhaps helping or hurting them as needed. Not necessarily lightweight, but easier to digest. Instead, the devs have presented us with a story that is nearly as dark and turbulent as any of their other 'The Walking Dead's, but this time with more of a personal emphasis. 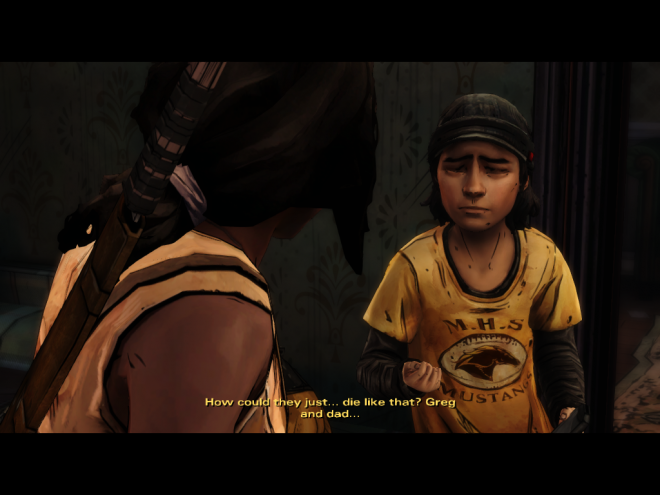 Lee and Clementine have been defined by their relationships with others, with the player’s response to those interactions showing their true colors. Michonne, on the other hand, is her own worst enemy. No matter how far she runs, she carries her adversary along with her. 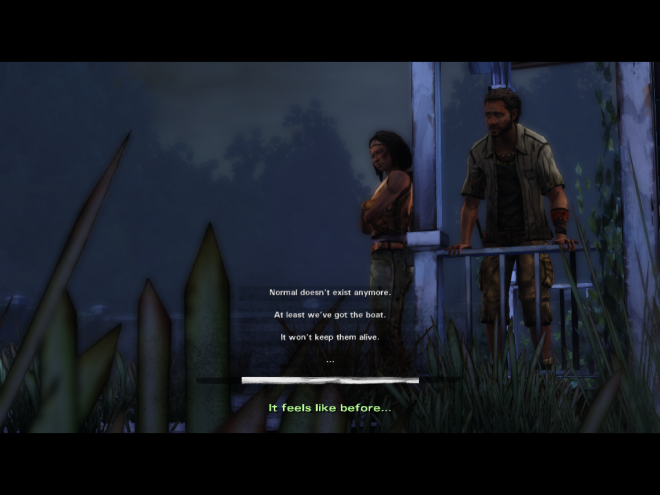 The Steam version of 'The Walking Dead: Michonne' doesn’t quite go fullscreen and tends to look a bit strained as a result. On the flipside, engine stutters are much less of a problem. Trying to control the quick time events with only a mouse and keyboard is not recommended, although there are fewer of them here than normal. Samira Wiley continues to deliver convincing performances as the nuanced Michonne, sounding authentic even on the rare occasion that the character is nice to other people. The rest of the voice cast is mostly solid. There were fewer big decisions in this episode than I am accustomed to in games such as these, which further diminishes the capacity for replays. The series seems to have gotten through all of its choices in the first two episodes (mostly the previous one). There have been so many ups and downs through the short run of 'The Walking Dead: Michonne' that, more so than the others, it would be better played in a single sitting, without weeks or months between episodes. Still, Michonne did a great job of holding my attention, and I will be sad to see her go. This has been a worthwhile deviation while we wait for season three of the main series.